This wide overshirt/jacket is gloriously roomy! 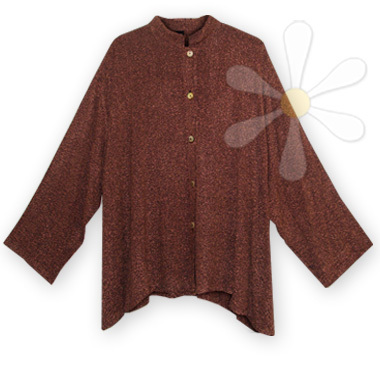 Featuring natural shell buttons and a cute stand-up/fold-down collar, this one has been created in our yummy-soft dark boucé, then over dyed in earthy Terra. Even wider at the bottom, it's especially designed for those of us a bit curvier at the hips. We think of it as easy classic comfort!